A Wal-Mart employee keeps an eye on the roaster as a bushel of green chiles makes the rounds this morning in front of the store. The intoxicating aroma of roasting chiles signifies the return of fall to New Mexicans more than any other… even pumpkin spice. 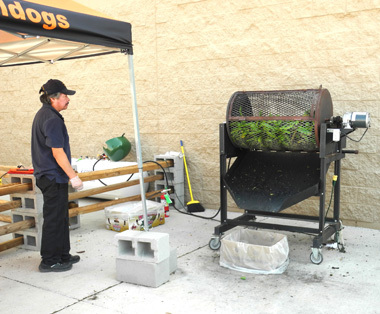 Wal-Mart is roasting chiles upon request from 9 a.m. – 7 p.m. Mondays through Sundays, while at Fenn’s Country Market, chiles can be roasted upon request any time during store hours on Mondays, Wednesdays and Fridays.